Yes, we’re early, but Song of The Week just couldn’t wait. I live in the only non-Christian country in the Western world, so things are pretty normal out on the streets (well, ‘normal’ by local standards). It’s quite a shock for people who come from abroad to spend Yuletide here, how conspicuous it is in its absence. And take into account that I live about 85 kilometers (52 miles) from the original manger. That’s easily traversed on camel-back in two days. As close as it is, it’s a rather foreign event here. But I grew up in a wholly Christian world, so I feel pretty comfortable about the whole thing, just a bit distanced from it. There have been years when I haven’t even noticed its passing beyond a mention or two on the local news. But this year I’ve been more attuned to the holiday season for a variety of reasons, not the least of which is that the great majority of SoTW readers abide in The Big World Out There. So I figured it would only be proper to dedicate this week’s posting to the good old red-and-green. The world would be a poorer place without Christmas music. So much of our Western tradition revolves around it, from Liturgy’s Greatest Hits to Bob Dylan’s recent (some would say ‘bizarre’, others ‘unfortunate’ “Christmas in the Heart”). What is Christmas music for me? Well, of course, it’s Nat King Cole, and Bing Crosby. But there’s a lot of my high school Ensemble in there, too. We had a whole repertoire of holiday songs, many of which I can still sing through without blinking, and we’d perform every night in December, it seems. So with such a wealth of riches, I had no easy task picking our SoTW. I had a harder job than good old King Solomon. He just had to pick between two mothers. I had to pick between three songs. Just yesterday I received a link from my old friend A.B. I’m not going to discuss theology with him, but I sure do like his taste in music. He sent me “O Magnum Mysterium” by Morten Lauridsen, as performed by the Nordic Chamber Choir. I had never heard of any of the three. It’s a beautiful, spiritual, sacred motet, a cappella. Morten is a USC professor and 3-time Grammy nominee. And it turns out that he is currently “the most frequently performed American choral composer”. Well, how about that? Well, I’ve been away for a long time. Give a listen to that Nordic Choir. Just about perfect, I’d say. But I said, heck, I just heard that today. I’m not going to go running around promoting a piece I just met today. So then I asked myself, ‘Jeff, what’s the best song you know that talks about Christmas?’ No contest. Joni Mitchell’s ‘River‘. Song of The Week? No way. I’m not going to shoot my wad on Joni with the clock ticking, and I’m not going to choose one of her best-known songs when I do. But mostly, the song’s just so damn depressing, and I didn’t want to be in the position of disseminating non-holiday spirit. 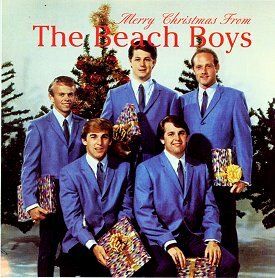 So I ran a quick search through the musty catacombs of my brain, and one old buddy was just sitting there, polished all candy-apple red, grinning, waiting to be retrieved — The Beach Boys “Little Saint Nick“. I’ve written before about The Beach Boys (SoTW 4, ‘Kiss Me Baby’, SoTW 118, ‘Surf’s Up’, SoTW 158, Paul Simon singing ‘Surfer Girl‘), and I was hesitant to repeat myself, especially with a song of theirs that speaks for itself (as opposed to the ones that I so quixotically champion in the face of universal indifference). But what the heck? Who can resist this ebullient hot-rod carol? So to our readers all over the world, from the whole staff of Song of The Week, y’all have a good holiday — everyone, everywhere. hey jeff, been ages. i’ve been really busy. after my return from the states, yoram’s mother passed away, and there was all of that. (they got up from shiva last fri.) i hope we can get together soon. enjoy what’s left of chanukah. i have tons of christmas memories (good ones) and love the carols ! we weren’t allowed to hear them as kids – you think that had something to do with it ? I come from a mixed marriage and was raised in a Unitarian church that celebrated Christian and Jewish holidays, among others. As a lifelong choral singer I have always loved the beautiful Christmas repertoire. I love all of the songs you deliberated over, and as for choral singing, both the Beach Boys’ harmonies and the sublime Nordic Chamber Choir do it for me – thanks, Jeff, for introducing me to them and Lauridsen (I’ve heard other versions of O Magnum Mysterium). Happy Hanukah, Merry Christmas, Happy 2012, and whatever other holidays any of you may be celebrating. And what a white-almost-xmas it turned out to be! I guess Magnum is mysterious. For me Joni Mitchell’s Blue is classic American music. Each song is personal and deep, which defies it’s musical simplicity. “River” from that collection has become a revered Christmas classic even though it’s less about the holiday than it is about heartbreak and remorse. It’s been done to death, and as Joni herself said (and I paraphrase) about “Both Sides Now”, as it’s mother I should have prevented it from going certain places…. It’s a gorgeous song that no one has even come close to it’s own “mother’s” version. That being said “Little Saint Nick” does extol the elements of a great Christmas classic. Bells jingle, harmonies abound. 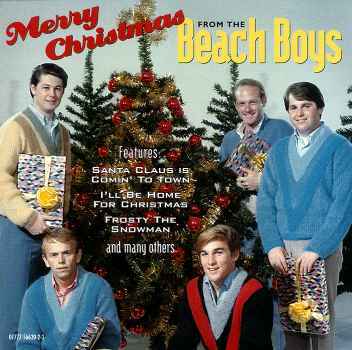 It’s the Beach Boys for Christmas’ sake! Ha! However nothing sings Christmas to me like Phil Spector’s Christmas album. The Ronettes, the Crystals and especially, what will become the voice of Christmas, the wonderful Darlene Love. That’s what Christmas sounds like to me. As a collector of Christmas music so much of today’s tracks uses Mr. Spector’s sound to Chrismasy it up. And of course all the Motown Christmas classics, but especially The Supremes and Stevie Wonder. That’s what Christmas means to me, my love! HAPPY NEW YEAR JEFF!!! Thanks for the conversation.